I would like to offer this letter of recommendation for you to use with any prospective clients. I feel that a person’s house says more about him/her than any other object they might own. As you know, our house was photographed for LUXE magazine a few years ago. To me, it was a little sad that they gave us 14 pages in the magazine, but exclusively inside shots. I believe that one of the things that makes our house special, is the outside areas, which totally reflect your designs. We love to entertain outside. 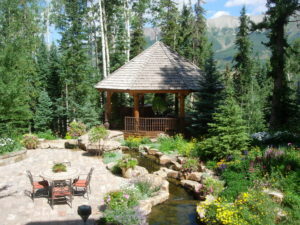 The water feature is the nicest I have ever seen, and the gazebo is a favorite spot on summer evenings. We may put our house on the market this summer, with the idea of building another, smaller version, in the area. I would hope you could be a part of that project, as well.